The Australian government is waging war on cats, and we need your help to speak out against them. Right now, Australia’s Ministry of the Environment is killing two million cats by 2020 with cruel methods like poison in a misguided and ineffective attempt to save endangered wildlife. Our new pledge calls for the killing to stop, supports nonlethal methods, and addresses the real threat to Australia’s wildlife—human habitat destruction. By signing the pledge, you tell the world that you want to protect cats and oppose the cruel plan to kill them. As the cats’ leading advocate, Alley Cat Allies pledges to work to end the killing of Australia’s cats. We hope you will join us. Sign the pledge and learn more about Alley Cat Allies’ work in Australia. El Paso’s community cats now have more protections! On February 23, the El Paso City Council voted unanimously to amend the city’s animal ordinances to include protections for community cats and their caregivers. They also voted to create a Trap-Neuter-Return (TNR) program through El Paso Animal Services. El Paso’s ordinances now support TNR, and include special policies that will keep cats that are already eartipped, which indicates that they are neutered and vaccinated, out of shelters. See how El Paso has changed for the better of cats and the community. Great news for Virginia’s animals! A bill that could have contradicted the Promote Adoptions Bill no longer poses a threat. The Promote Adoptions Bill, which passed last year, was a great achievement for advocates and guaranteed that private animal shelters are only “operated for the purpose of finding permanent adoptive homes for animals”. A new bill, introduced this year, challenged that, but amendments ensured it stays true to the intent of the Promote Adoptions Bill. Learn more about the bill amendment and what it means for Virginia’s animals. The hearing on the case of Kristen Lindsey, the Texas veterinarian who killed a cat with a bow and arrow and bragged about it on Facebook, has been delayed indefinitely for a mediation period. Mediation could allow more time to investigate new details in the case, including evidence that Lindsey made false statements and misrepresentations. Alley Cat Allies submitted an amicus brief in support of revoking Lindsey’s veterinary license, and we will keep you updated on developments. Read more about the new details of the Kristen Lindsey case. Thanks to the overwhelming support of Hawaii cat lovers, a bill that would have banned feeding cats on public lands was deferred. The bill, which was considered by the Hawaii Senate Committees on Water, Land, and Agriculture and Economic Development, Environment, and Technology, would have made it illegal for people to practice TNR, the humane and effective approach to community cats. This is a great first step, but it’s important to keep speaking out so the bill won’t be reconsidered! Learn more about the feeding ban bill and how Hawaii residents can act against it. The North Alabama Spay-Neuter Clinic, which shut down in April 2014, has reopened as of February! The non-profit, low-cost clinic is now available to the community with no income or residential restrictions. Alley Cat Allies has been very involved with cat protection efforts in Alabama, especially protecting the state’s few spay/neuter clinics. We’re happy to see the clinic reopen, as they provide vital services that protect Alabama’s animals and make TNR possible. Read about the reopening of the North Alabama Spay-Neuter Clinic. Dunesberry was found outside as a very small kitten in Atlantic City, New Jersey, but now she is growing up and is ready to give you all her energy and love. She’s peppy and curious, loves to eat, and enjoys a good game of fetch. She’s very playful, so she would do great with another young cat who can keep up with her. Dunesberry is FIV positive, but she’s not worried about it! She can live just as long, happy, and healthy a life as any other cat. If you’re in the Atlantic City area, Dunesberry would love to join your family and liven up your home! Find out how you can adopt Dunesberry today. Connecting with future veterinarians at SAVMA! We’re exhibiting at the Student American Veterinary Medical Association (SAVMA) Symposium in Ames, IA from March 17–19. Learn about the Symposium and how to attend. Meet us at the Whole Cat Workshop on March 20! Becky Robinson will be the keynote speaker at this Massachusetts workshop for cat lovers, professionals, and volunteers. Learn how you can attend the workshop. We’re exhibiting at the VFHS Conference! The Virginia Federation of Humane Societies (VFHS) Conference in Charlottesville, VA from March 31–April 2 is a great opportunity to connect with animal lovers and professionals. Learn about the conference and how to register. With our support, the Hillsborough County Pet Resource Center enacted a Wait Until 8 program that has saved over 114 kittens since spring! The program empowers people to care for neonatal kittens until they are eight weeks old—when they can safely be spayed/neutered—before bringing them to the shelter. Now when someone brings in neonatal kittens, shelter staff provide them with individualized instruction and an Alley Cat Allies-supplied kit of formula, bottles, and more. Once the kittens are eight weeks old, caregivers can bring them back to be spayed/neutered and adopted. Read more about the Wait Until 8 program and how it’s saving 2/3 of kittens brought into the shelter. Maryland is funding crucial spay/neuter services for community cats! In November, the Maryland Department of Agriculture awarded almost $600,000 in grants to nonprofits and government agencies to spay/neuter community cats and pets of low-income citizens. The grants are part of Maryland’s new spay/neuter program designed to reduce the number of cats and dogs killed in shelters. They are the first round of grants to cover community cats, and they will fund thousands of lifesaving surgeries. Read more about Maryland’s grants to protect community cats. Alley Cat Allies is helping Lake County, Florida change their shelter and community to protect cats. We traveled to Lake County in November to hold a workshop for the community, and visit Lake County Animal Services (LCAS) to educate shelter staff about humane approaches to community cats. We proposed shelter reform policies like eartip protection and diverting cats to TNR programs to help LCAS save more cats. Shelter overseer Captain Todd Luce and his staff were very open to the changes, and we look forward to working with them make it happen. Learn more about our progress in Lake County. Our new Shelter Series gives animal shelters the tools and protocols they need to protect cats. The Shelter Series consists of toolkits that provide detailed guides to create programs that manage concerns about cats and TNR, provide foster care, and effectively communicate with the public. The series was created to empower shelters to take charge and make humane, lifesaving change. We thank Humane Network for working with us to write these invaluable guides—they will help save even more cats’ lives! Explore the Shelter Series toolkits. Julius is a loveable five-year-old with an adorable half-orange head. He showed up at a colony in New Jersey in rough shape, but Alley Cat Allies staff moved quickly and got him care. Now Julius is maintaining his health, but due to his kidney disease, he is looking for a permanent foster home. Julius is very sweet and is a calm and relaxing companion! If you’re interested in becoming his permanent foster parent, Alley Cat Allies will pay for medical expenses and food for the rest of Julius’ life. All you need to do is provide the love! Find out how to take Julius home today. Keep your colonies warm for the winter. We can get you started building the best shelters to protect community cats from the cold. Learn how to build the warmest, safest cat shelters or purchase them pre-built! Watch our webinars any time! Our free webinars are always available and will teach you how to care for community cats and kittens, advocate for cats in your community, and more! View our webinars anytime and anywhere. © 2015 Alley Cat Allies | All rights reserved. Unsubscribe or manage your preferences. Do not respond to this email. Are you looking for assistance with cats? Use our Assistance Form. I need your help to protect Trap-Neuter-Return (TNR) and community cats in the nation’s capital. D.C. is considering a plan that would roll back decades of progress and set a dangerous precedent for TNR programs nationwide. The “Wildlife Action Plan” from the District Department of Energy and Environment (DOEE) calls for D.C. to “revisit” its longstanding TNR policy, and states that all community cats should instead “be taken in by several adoption facilities operating in the District”. Act now: sign the petition to demand protection for D.C.’s cats and TNR program. Community cats will be killed in shelters—all in a misguided attempt to protect wildlife. DOEE Director Tommy Wells thinks euthanizing community cats is a viable option to “promote biodiversity and not just population control.” Killing cats will do neither of these things and wastes lives. Only TNR humanely and effectively reduces the community cat population. Human activity, pollution, and habitat destruction are the true threats to wildlife. Catching and killing cats is not only cruel, it’s ineffective: removing cats is counterproductive and creates a vacuum effect where cats repopulate. 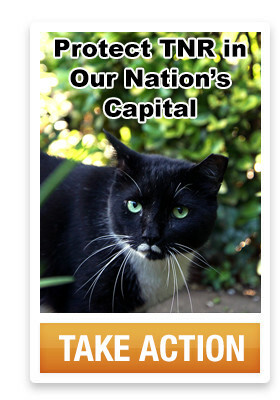 Take action: Ask D.C. to keep supporting TNR. Ending TNR will kill cats and do nothing for wildlife. Our nation’s capital is a model for the whole country, and its current TNR policy is both effective and cost-effective. Tell D.C. to protect that policy. P.S. Every voice counts. Forward this email to your friends and family. 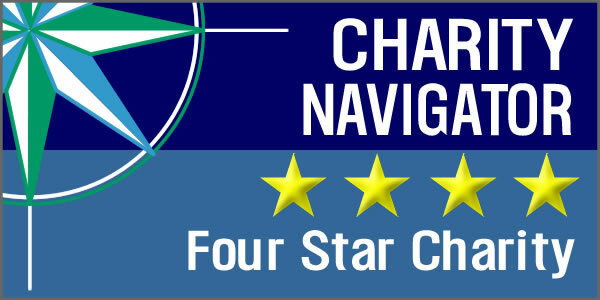 Alley Cat Allies is proud to have earned the highest rating of four stars from Charity Navigator, the nation’s largest and most respected charity evaluator. Join us and our more than 500,000 supporters at www.alleycat.org. Veterinarians’ support of Trap-Neuter-Return is critical, both to provide low-cost services for feral cats—and to show communities considering TNR that it’s backed by experts. Some of the country’s top TNR veterinarians signed a letter printed June 1 in the Journal of the American Veterinary Medical Association voicing their strong endorsement of TNR—and explaining why it is becoming the predominant method of feral cat care. We’re asking more veterinarians to sign a letter showing their support of TNR. The more that sign on, the more strength we’ll have behind our message: TNR works, and it works well. TAKE ACTION! Ask your veterinarian to sign the letter. On June 10, a “humane” officer in North Ridgeville, Ohio, shot and killed five kittens living in a woodpile in a resident’s backyard. If that’s not bad enough, children were in the house listening as each shot rang out from his .22-caliber handgun. The shooting sparked a nationwide outcry, as everyone from local animal rescue groups to people living thousands of miles away made it clear that shooting kittens is never acceptable. Alley Cat Allies’ Interim Executive Director Paul Berry traveled to North Ridgeville to support local residents and presented to the city council a petition with more than 30,000 signatures demanding humane policies for feral cats. As a result of the steadfast opposition to this shooting, North Ridgeville officials are considering major changes to the city’s policies and protocol for handling feral cats. Last month, a group of veterinarians, veterinarian technicians, and other volunteers, including Alley Cat Allies staff members, boarded a ferry and headed across the choppy waters of the Chesapeake Bay for a Trap-Neuter-Return mission on Tangier Island, Va. Low-lying Tangier is home to about 700 people—and more than 400 cats. Almost all of the islanders get around by golf cart, and the community cats trapped on this trip were no exception. In the midst of the downpours of Tropical Storm Andrea, the all-volunteer crew trapped about 100 cats. They neutered 35, revaccinated 60, and brought six kittens back to the mainland for adoption. The trip was organized and funded by the veterinary-run Caring Hands Animal Support and Education (CHASE), which has embarked on multiple TNR trips to Tangier. After the first two trips in 2011, approximately 85% of the island’s cats had been sterilized! Adoptable Cats: Meet Jasper, Jace, and Arrow! At 10-weeks-old, these three sweet siblings are ready for their forever homes! Dapper Jasper, with his shiny black coat and white patch on his chest, is the most vocal and adventurous of the group. He loves to climb, explore, and inspect everything that comes his way. The charmer of the bunch, Jace, black with a white belly patch, is a bit more reserved, taking his time examining new things and more interested in cuddling than climbing. Angelic Arrow is the most tranquil of the trio. She has a soft black coat with specks of white, almost like salt and pepper. In the right light, she looks like she has a halo around her head, which matches her demeanor! These adorable kittens need loving homes—how about yours? See more photos of these adorable babies. Experience leading a mission-driven, grassroots organization? Proven skills for providing impactful transformation and day-to-day management of all aspects of an organization? A deep desire for social change and knowledge of animal rights or a strong advocacy background? That’s a great start. Learn more about the position. Read the latest good and bad stories impacting cats around the country. Find out who gets purrs—and who gets hisses. The early bird deadline for our National Conference: Architects of Change for Cats is approaching quickly. Register by July 31 and save money! It’s hot out there! Warmer weather means special considerations for feral cat colony care. Keep cats cool with our summer tips. BETHESDA, MD – Alley Cat Allies, the only national advocacy organization dedicated to the protection and humane treatment of cats, responded to a biased study on cats and wildlife published in the journal Nature , which it called a veiled promotion by bird advocates to ramp up the mass killing of outdoor cats. “This so called ‘survey of research’ seems just another misguided attempt to draw attention to the decline of wildlife by manufacturing a fake debate. The study conveniently sidestepped the primary culprit of decline of wildlife populations which, of course, is human activity including habitat destruction. “The authors also neglect to mention that their proposed ‘solution’ really endorses continuing the same failed policies of the last century which call for the mass killing of cats. Tens of millions of healthy cats have already been killed in animal pounds and shelters, at great taxpayer expense, without achieving anything. A policy of just more killing can never be the right answer,” she said. Robinson noted that Trap-Neuter-Return (TNR) does work to end reproduction and to stabilize the population of feral cats, and that is why every year a growing number of communities turn to TNR as an innovative, compassionate and common-sense approach. Alley Cat Allies is the only national advocacy organization dedicated to the protection and humane treatment of cats. Founded in 1990, today Alley Cat Allies has more nearly than a half a million supporters and helps tens of thousands of individuals, communities and organizations save and improve the lives cats and kittens nationwide. Their website is www.alleycat.org. BETHESDA, MD – Alley Cat Allies, the only national advocacy organization dedicated to the protection and humane treatment of cats, announced it has established two reward funds of $5,000 each in two separate but recent cases in Louisiana in which cats were brutally killed, and has also set up a tip line for members of the public who may have clues to help solve these crimes. Alley Cat Allies also said it has dispatched an on-the-ground investigator to seek answers. The first case, which occurred outside Baton Rouge, La., involved a 4-month-old kitten who was hanged in the front yard of his owner, a 76-year-old man. In the second case, caregivers who had been looking after a colony of nearly two dozen cats in Ethel, La. left behind at an abandoned home discovered many of the cats shot to death by a .22 caliber rifle and mutilated by unknown criminals. Prior to the crime, the cats’ caregivers had been feeding them and trying to get them placed in other homes. “We are outraged by these horrific crimes—and we know that many residents of these communities are just as shocked, just as outraged, and want these dangerous criminals brought to justice,” said Becky Robinson, president and co-founder of Alley Cat Allies. Robinson said Alley Cat Allies’ investigator has canvassed the neighborhoods with volunteers where each crime occurred, seeking tips and offering assistance to local sheriffs in identifying suspects. Alley Cat Allies is also offering two separate rewards of $5,000 each for information that leads to an arrest in either case; and has set up a tip line for residents to call in with any information they believe may be relevant: 1-888-6-HUMANE. Alley Cat Allies is the only national advocacy organization dedicated to the protection and humane treatment of cats. Founded in 1990, today Alley Cat Allies has nearly half a million supporters and helps tens of thousands of individuals, communities, and organizations save and improve the lives cats and kittens nationwide. Their web site is www.alleycat.org. BETHESDA, MD – Alley Cat Allies, the only national advocacy organization dedicated to the protection and humane treatment of cats, announced the 22 recipients of the National Feral Cat Day® Community Impact Awards, held in honor of the 12th annual National Feral Cat Day® on October 16. Each recipient receives a $1,000 award. Another 16 runners-up each receive a $500 award. “We are proud to honor these grassroots organizations who are working hard in their communities to provide humane education and programs to help save the lives of cats,” said Becky Robinson, president and co-founder of Alley Cat Allies. Alley Cat Allies is the only national advocacy organization dedicated to the protection and humane treatment of cats. Founded in 1990, today Alley Cat Allies has nearly 500,000 supporters and helps tens of thousands of individuals, communities, and organizations save and improve the lives of cats and kittens nationwide. Their web site is www.alleycat.org. BETHESDA, MD – Alley Cat Allies, the only national advocacy organization dedicated to the protection and humane treatment of cats, is counting down the days until the 12th annual National Feral Cat Day® (October 16) by urging advocates around the country to start planning now for events and programs that raise awareness about feral cat care, Trap-Neuter-Return and the need for positive, sustainable change for all cats in communities large and small. Robinson noted that National Feral Cat Day® is not just a single day, but an opportunity for supporters to rally for longer-term change with programs that make a difference in the lives of cats and best address their communities’ needs: starting a TNR program; holding ongoing educational workshops; expanding low-cost spay/neuter clinics for feral cats and pet cats; or encouraging policymakers to adopt common-sense initiatives that protect and improve the lives of cats. Alley Cat Allies launched National Feral Cat Day® in 2001 to raise awareness about stray and feral cats, promote Trap-Neuter-Return, and recognize the millions of compassionate citizens who care for cats. Since then, more than 250 local nonprofit organizations have been formed to educate their communities about feral cat colonies and carry out TNR programs. “TNR is a positive and sustainable program because it stabilizes the population while respecting the lives of cats and the needs of the communities in which they live,” said Robinson. Alley Cat Allies is the only national advocacy organization dedicated to the protection and humane treatment of cats. Founded in 1990, today Alley Cat Allies has more than 260,000 supporters and helps tens of thousands of individuals, communities, and organizations save and improve the lives cats and kittens nationwide. Their web site is www.alleycat.org. BETHESDA, MD— Alley Cat Allies, the only national advocacy organization dedicated to the protection and humane treatment of cats, today condemned a plan by the Arkansas Game and Fish Commission to trap and remove cats at Barnett Access in Heber Springs, Ark. Last week, the Game and Fish Commission declined offers by Alley Cat Allies to coordinate a Trap-Neuter-Return program for the cats at no cost to the state. Feral cats are not socialized to people and cannot be adopted into homes; they live outdoors in family groups called colonies. Trap-Neuter-Return is a humane method where feral cats are trapped and taken to a veterinarian to be neutered and vaccinated. After recovery, the cats are returned to their home—their colony—outdoors. No new litters are born, and socialized cats and kittens are removed from the grounds and adopted into good homes. “It’s reprehensible and fiscally irresponsible that the Game and Fish Commission has chosen to waste tax dollars based on bad science,” said Robinson. Alley Cat Allies is the only national advocacy organization dedicated to the protection and humane treatment of cats. Founded in 1990, today Alley Cat Allies has more than 260,000 supporters and helps tens of thousands of individuals, communities, and organizations save and improve the lives of millions of cats and kittens nationwide. Their web site is www.alleycat.org.